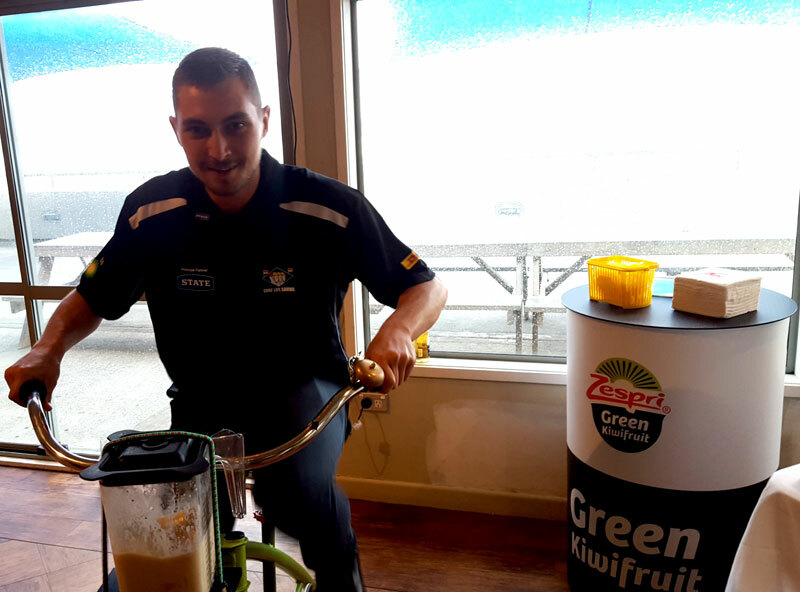 Chaz making his kiwifruit smoothie at the launch. Zespri announced on Wednesday it will be the Primary Regional Partner for Surf Life Saving New Zealand in Bay of Plenty, Coromandel and Gisborne, offering free lifesaving training for local lifeguards. Surf Life Saving New Zealand Eastern Region Manager Chris Emmett says that with 1,200 lifeguards from the 19 clubs in this region, offering training at no cost to participants will make a huge difference to beach safety. Training courses typically cost hundreds of dollars and the cost has until now been borne by individual lifeguards and clubs. Zespri Chief Operating Officer Simon Limmer explains around 85 percent of Zespri Kiwifruit is grown in these regions and this partnership is Zespri’s way of giving back to the communities who support this industry. “We will provide free training opportunities for all local lifeguards in the Eastern Region over the next three years, as well as providing rescue tubes and additional equipment to the Zespri Clubs of Year. Surf lifeguards save around 450 lives a year in our region and provide a vital service to the families who live and work in our regions. ← Whiritoa Beach, now world famous in Australia….